One of the most significant costs for operating a commercial pool is paying to warm the water. What if you warmed that water for free instead? 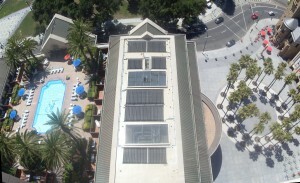 The sun is plentiful in California and that makes it the best locale for solar pool heating systems. And Solaron is the California leader for sales of one of the finest systems available – Heliocol water heating solar panels. Even better, businesses do not need to pay the full cost of installing a solar pool heating system. Considerable rebates are available to help cover the expenses involved in using solar heating with multi-family pools. Saving on gas expenses and the system installation is a win-win deal for businesses in California! When you request a solar pool heating installation from Solaron of Sacramento, we oversee the entire project from start to finish. First, you receive a free consultation and estimate at your property in Walnut Creek. Second, we design, engineer and secure the permits for your project. Finally, we build the pool heater to your satisfaction and make absolutely certain that you get all applicable rebates. All you do is sit back and save money! To start the process of installing your solar pool heater, call Solaron today at 916-631-9293.